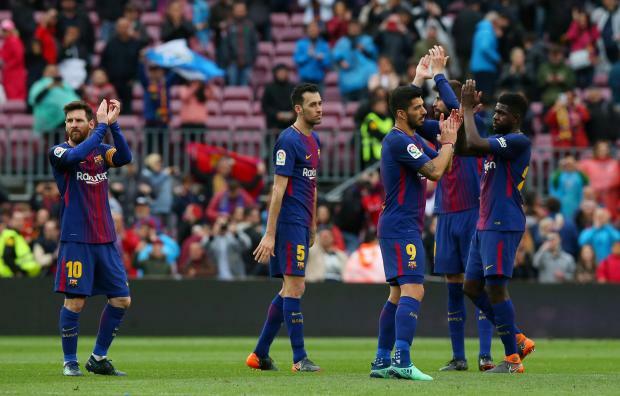 Barcelona players celebrate after the match. Barcelona responded to their shock Champions League elimination to AS Roma by beating Valencia 2-1 on Saturday in a subdued atmosphere at the Nou Camp, setting a Liga record run of 39 games unbeaten and taking them ever closer to another title. Luis Suarez gave Barca the lead after a quarter of an hour by meeting a delicious outside-of-the-foot pass from former Liverpool teammate Philippe Coutinho, scoring with one touch from close range. Club-record signing Coutinho then delivered an outswinging corner from which Samuel Umtiti headed in Barca's second in the 51st minute, shortly after Gerard Pique had saved Umtiti's blushes by clearing a shot from Valencia forward Santi Mina off the line following a slip by the France defender. Captain Dani Parejo pulled a goal back for third-placed Valencia by squeezing an 87th-minute penalty under Barca goalkeeper Marc-Andre ter Stegen, but the Catalans withstood an exciting final spell to move effectively to within seven points of their 25th league title. Ernesto Valverde's side lead nearest challengers Atletico Madrid by 14 points in the standings, with Atletico hosting Levante and fourth-placed Real visiting basement club Malaga on Sunday.